Pegeen® announces the launch of their interactive design tool sure to capture the imagination of little girls, anxious brides and moms called the Pegeen® Dress Dreamer™. 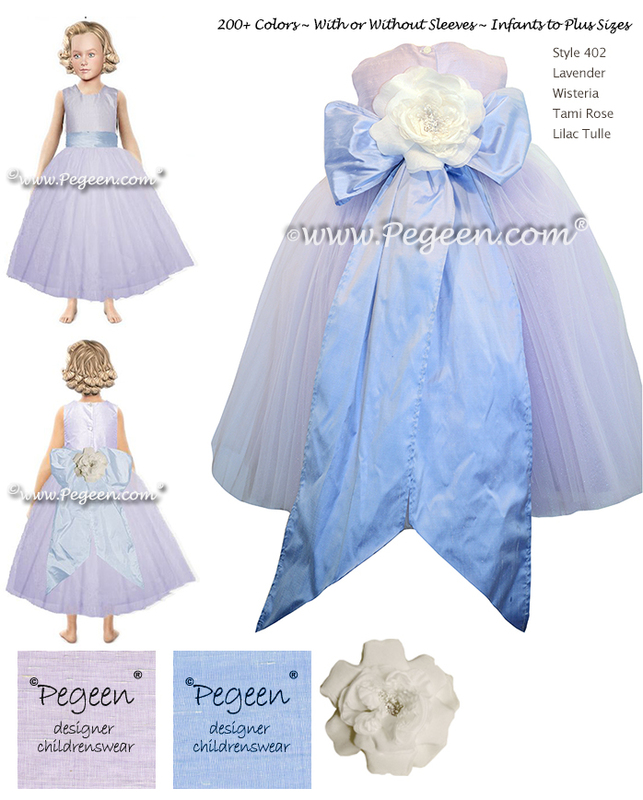 The online provider of custom, couture quality flower girl dresses has just launched a virtual dressing room called “The Pegeen® Dress Dreamer™” a design tool which allows the user to see tens of thousands of ways Pegeen allows them to customize their children’s clothing using a simple mouse click and drop. Not only will moms and brides be able to plan the children's clothing from separate locations, but they can plan the intimate details and color combinations that brides are choosing for their weddings. "We were so excited about our virtual closet, we even announced it at NY's Times Square." Until recently, Adobe flash was the industry standard for developing this type of project. Pegeen's development department chose to investigate jQuery as an alternative to "Flash Animation". “jQuery was actually perfect for the job, blending compatibility and functionality” said their developer, Robert Fong. “The Pegeen® Dress Dreamer™, also known as a virtual closet, is compatible with desktop and mobile devices.” While the virtual closet is not a brand new idea, it hasn't been widely adopted in the industry due to the maturity of the technology and its complexity. Pegeen understands the importance of a virtual closet and the needs of their customers to not only be able to design with thousands of combinations that Pegeen uniquely offers, but complete the online shopping experience. “The virtual closet makes it fun for our customers as well as solving a complex problem: ‘what will my dress look like’. “Just last evening, one of our first few dozen customers to try the Pegeen® Dress Dreamer™, remarked ‘Wow, how much fun! This is just like Colorforms and my daughter is going to love this’. Exactly, it works!” remarked Ms. Hyland. Pegeen has chosen to extend the functionality from design to sales, allowing the customer to actually purchase the combinations they have designed. Many companies do try to use similar approaches so you can “try on” your outfit from multiple manufacturers or in the case of store brands where you can add items to your virtual closet from their collection, Pegeen once again takes this a step further and the implication for future development with strategic partners is endless. What The Pegeen® Dress Dreamer™ allows their customers to do is component shop, so to speak, designing their own dress using categories for bodices, skirts, sashes, trims and enhancements. By dragging and dropping the different parts of the dress onto their Model-Of-The-Year winner’s likeness as their avatar, the customer can design their custom outfit, price it out and purchase the item. Certainly no one in the industry does this and in the children’s wear industry a virtual closet of any type is unheard of. While others are waiting for such concepts to mature, Pegeen is forging ahead bringing the concept to customers now. As far as Pegeen® knows, there has not been movement in their area to use such a idea. Moreover because Pegeen® is a manufacturer and not just purchasing goods to sell, these are factory to consumer custom designs with delivery in just days or weeks, not months! Once the Dress Dreamer is completely finished, we will add boy’s styles and then Pegeen is planning on expanding the virtual closet into a kiosk format at several secret retail locations the company is planning to open soon where millions of customers come to visit. “By allowing customers at these locations to use the real-time design features of the Dress Dreamer™ we plan to give them express pick-up at a premium charge so they can go home with their newly sewn Pegeen creation in hand.” The latest version of the Dress Dreamer™ will offer an avatar library and the ability to send the designed avatar to friends and family. Printing an order receipt to expedite in-store ordering further extends the kiosk functionality while retaining the ability to process the order in real-time via the internet. Pegeen will also continue to ship their creations all over the world as they do now. In addition to the Pegeen® Dress Dreamer™, brides and moms can be inspired though a feature on the website called "What Others Have Done". They can also look under their Testimonial and Real Wedding Gallery, Weddings by Color, and literally 20,000 or so images of real events. In this way, the customer can see the vast variety of unique combinations of styles and colors that Pegeen is well known for. Most importantly, Pegeen® has made it easier for brides to place their on-line orders with our Live Chat or phone lines that are open every day from 8am to 11 pm (Midnight from Memorial Day thru Labor Day) and the addition of “Pegeen® Dress Dreamer™”. "We like to brag that when you chat with us you are dealing with a designer not just a sales representative". Pegeen's® unique and successful formula is evident from the abundant number of referrals, repeat business and the quality of its creations. Moreover, Pegeen's® Plus Size Girl Division is solving the vast needs of Plus Size Children. "Our program consists of sending a bodice in the mail for them to try on, then we work our charms for the perfect fit". This was recently praised by the mom of a plus size child who wrote: "Marg & the Gang at Pegeen - This is just magic in a box". Pegeen’s® goal is to provide their brides a personalized experience allowing mix and match styles and exclusive finishing touches to make a look that is one of a kind. With the click of a mouse a bride is able to preview how fabric, dress style, and other finishing touches work together. By showcasing real weddings on Pegeen's Rave Pages a bride is able to see today’s most popular color palettes with over 200 choices of color, cut and dress styles. It’s the ultimate in personalizing the look of a bride’s once-in-a-lifetime experience. “It's amazing how a ribbon or sash can instantly change the look by adding color and style to any dress. These versatile accents of our color swap options, various bows, and sashes as well as flower styles are designed to help coordinate the entire bridal party and are sure to flatter.